Guardamar, on the Costa Blanca, in Spain, is surrounded by two large and beautiful natural salt water lakes which form the Salinas de Guardamar and are an official Spanish Nature Reserve. Guardamar del Segura is a smallish typically Spanish Coastal town. 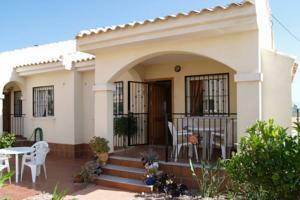 It lies on the River Segura and enjoys an enviable coastal position. The town has a wonderful landscaped park where you can sit and relax, long sandy beaches and a large coastal pine forest. The Dunas de Guardamar cover an area of over 800 hectares, running parallel to the coast. They are sand deposits left by the Segura River and the Sea and at one time the threat of the town being covered by sand was a real possibility,For this reason the huge expanse of pine forest was planted in the early 1900s. Local fiestas are celebrated in Guardamar year round. The main festivals are in Holy Week (Easter), on the 21st June the "Planta" de las Hogueras are celebrated where bonfires are lit in the town and fireworks explode from the castle. The Moors and Christians is the most popular summer festival celebrated in the second Sunday in July and in honour of Saint James, the people of Guardamar dress as Moorish warriors and Christian troops and parade through the streets to the castle where fireworks are exploded. In September and October the fiesta in honour of the "Virgin of Fatima and Rosario" are celebrated. They are a wonderful opportunity to take part in traditional Spanish custom and are a colourful and fun way to spend an evening. The local market day is Wednesday Morning in the town and on Sundays there is a very large market in the Campo de Guardamar which adjoins the Urbanisation which is a 10 minute walk from the villa. You can enjoy a drink & a snack or a meal in the semi-permanent catering area --German, Spanish, English etc. 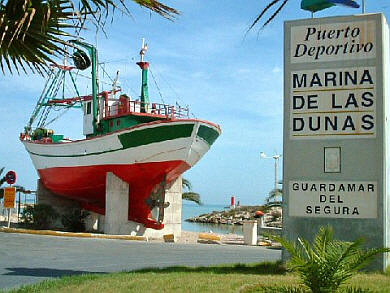 Local entertainment and restaurants are closest in Guardamar or Quesada but Torrevieja is only a few minutes more. Guardamar, known also as Guardamar del Segura and sometimes mis-spelt as Guadamar, Gaurdamar, Guardamer, Guadarmar and Guardarmar, is a developing tourist centre and one of the most important on the Mediterranean coast. However, you'll find it is not nearly as commercialised as the Costa Blanca resorts to the north of Alicante. It still retains that special "Spanish" feel and is in a relaxed environment. The concentration of salt and the temperature, combine to endow this area with a particularly healthy micro-climate, recommended by doctors for its beneficial properties. Bathing in the salt lagoons is also becoming popular for many medicinal reasons. The climate in Guardamar makes it an ideal location for year round holiday activities, especially if you want to fulfil that yearning for some sunshine during those dreary winter months in the UK. Marina Las Dunes, known officially as Marina de Las Dunas Text and photo for the marina in Guardamar kindly supplied by Alan and Jean from Bridgnorth, Shropshire in England.